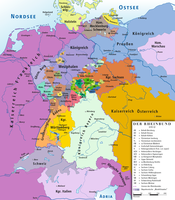 In 1396 Vaduz (the southern region of Liechtenstein) gained imperial immediacy, i.e. it became subject to the Holy Roman Emperor alone. 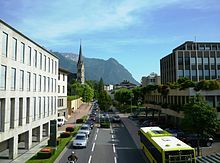 The government of Liechtenstein taxes personal income, business income, and principal (wealth). The basic rate of personal income tax is 1.2%. When combined with the additional income tax imposed by the communes, the combined income tax rate is 17.82%. An additional income tax of 4.3% is levied on all employees under the country's social security programme. This rate is higher for the self-employed, up to a maximum of 11%, making the maximum income tax rate about 29% in total. The basic tax rate on wealth is 0.06% per annum, and the combined total rate is 0.89%. The tax rate on corporate profits is 12.5%. Liechtenstein is a principality governed under a constitutional monarchy. It has a form of mixed constitution in which political power is shared by the monarch and a democratically elected parliament. There is a two-party system and a form of representative democracy in which the prime minister and head of government is responsible to parliament. 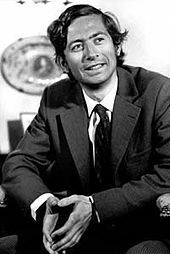 However the Prince of Liechtenstein is head of state and exercises considerable political powers. 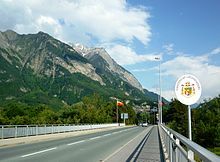 Liechtenstein's foreign economic policy has been dominated by its customs union with Switzerland. This union also led to its independent membership in the European Free Trade Association (EFTA) in 1991. Unlike Switzerland however, Liechtenstein is part of the European Economic Area. Vaduz is the capital of Liechtenstein and also the seat of the national parliament. The town, which is located along the Rhine River, has 5,450 residents. 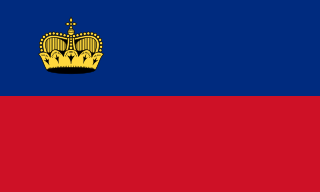 The flag of Liechtenstein consists of two horizontal blue and red bands charged with a gold crown at the canton. Adopted in 1921 after being officially enshrined into the nation's constitution, it has been the flag of the Principality of Liechtenstein since that year. The crown was added to the flag in 1937 after the country found out at the Summer Olympics held the previous year that their flag was identical to the civil flag of Haiti. The Alpine Rhine Valley is a glacial alpine valley, formed by the part of the Alpine Rhine between the confluence of the Anterior Rhine and Posterior Rhine at Reichenau and the Alpine Rhine's mouth at Lake Constance. It covers three countries and the full length of the Apine Rhine is 93.5 km. 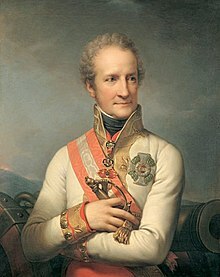 Johann II, also known as Johann II the Good, was the Prince of Liechtenstein between 1858 and 1929. His reign of 70 years and 91 days is the second-longest of any major monarch in European history after that of Louis XIV of France. Schellenberg is a municipality in the lowland area of Liechtenstein, on the banks of the Rhine. As of 2017, it has a population of 1,090 and covers an area of 3.5 km2 (1.4 sq mi). Schaan is the largest municipality of Liechtenstein by population. 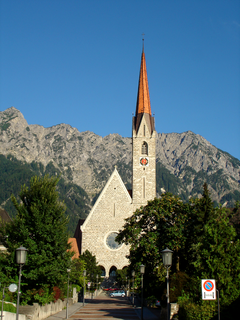 It is located to the north of Vaduz, the capital, in the central part of the country. As of 2015 it has a population of 5,983 making it the most populous administrative district in Liechtenstein, representing an important traffic hub and industrial location of the country. 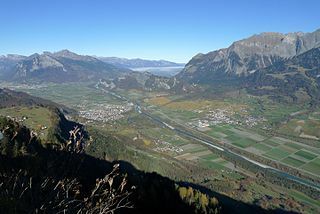 Schaan covers an area of 26.8 km2, including mountains and forest. It is a municipality within the electoral district of Oberland in the Principality of Liechtenstein. 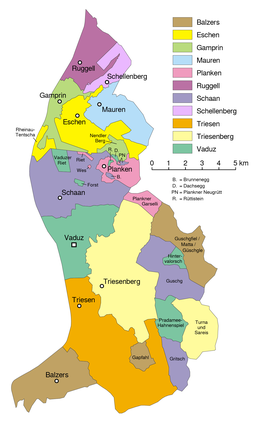 Schaan has four enclaves, two of which belonging to Vaduz and Planken. 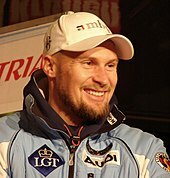 Peter Karl Jehle is a Liechtensteiner retired footballer who played as a goalkeeper. 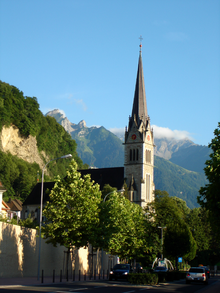 The Jewish community of Liechtenstein today is a population of 26 people. 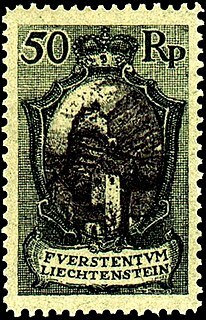 This is a survey of the postage stamps and postal history of Liechtenstein. The Prince Regnant of Liechtenstein is the monarch and head of state of Liechtenstein. The princely family of Liechtenstein, after which the sovereign principality was named in 1719, hails from Liechtenstein Castle in Lower Austria, which the family possessed from at least 1140 to the thirteenth century, and from 1807 onward. It is the only remaining European monarchy that practises strict agnatic primogeniture, meaning only first-born males may inherit the throne. The education system in Liechtenstein is similar to the Swiss education system. 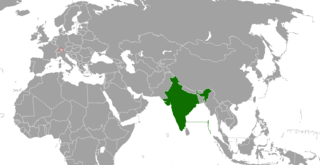 India–Liechtenstein relations refers to the international relations that exist between India and Liechtenstein. The Embassy of India in Berne, Switzerland is concurrently accredited to Liechtenstein. Liechtenstein maintains an honorary consul general in New Delhi. Under a 1919 agreement between Liechtenstein and Switzerland, ambassadors and diplomatic missions of Switzerland are authorised to represent Liechtenstein in countries and in diplomatic situations unless Liechtenstein opts to send its own ambassador. Switzerland maintains an embassy in New Delhi and a consulate in Mumbai. The Lordship of Schellenberg was a historic state of the Holy Roman Empire, now located in the Principality of Liechtenstein. Its capital was the town of Schellenberg. The County of Vaduz was a historic state of the Holy Roman Empire, now located in the Principality of Liechtenstein. Its capital was the town of Vaduz.